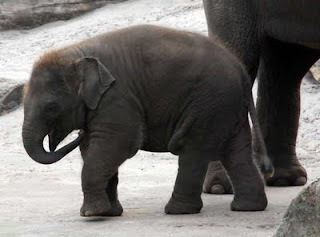 One day the little ones and I packed up all our stuff and went off to the zoo to see the baby elephant. He was very cute. But this is not about him. It is about a photo I took of a gorilla. Being a parent, and in the interests of safety, I feel compelled to alert the little ones about the dangers of hanging upside-down off the roof, sticking forks into eyeballs, etc. And sometimes I feel I am talking and talking while no-one is listening. Sometimes I feel like this gorilla. Okay, enough about being a parent. I love a trip to the zoo! Mr. Snuffles is quite handsome. Good luck getting people behind this one. Though you make some VERY fascinating points, you’re going to have to do more than bring up a few things that may be different than what we’ve already heard. What are trying to say here? What do you want us to think? It seems like you can’t really get behind a unique thought. Anyway, that’s just my opinion. The little ones don't eat spam. The elephants are so cute!!! You should read Moby the Fishes Blog if you have some free time. I am a very dedicated follower! Mr Snuffles is indeed cute and handsome. I also feel like the gorilla sometimes. I have only one "little one" (who is, in fact, quite big now) and a "big one" too... they often don't appear to be hearing me, even if they believe they are listening. Sometimes I just have to let them find out what happens when they do what I suggested they don't do. But then, they are a lot bigger than your Little Ones. 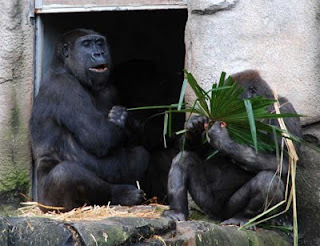 Maybe you should ask the gorilla if he does Bed and Breakfast? "if you can't say anything nice then don't say anything at all!" Thank you for your vote of support Lizzie. There are days when I feel as though I have just escaped from the zoo, but I haven't actually been in quite some time.